Diversity: Anthony Berkeley Cox’s commitment to the crime novel is evinced from his first appearance on the scene with the publication of locked-room stumper The Layton Court Mystery (1925) for which he didn’t even bother to make up a nom de plume. Early versions of the book simply had the author listed as “?” – message: you want a puzzle, here’s a puzzle. You were getting – before Carr, before Queen, before Christie was anything close to a household name – the promise of something that had mystery not just in its title but at its very heart (and the follow-up, The Wychford Poisoning Case (1926), was published as by The Author of The Layton Court Mystery!). Sure, it was demystified shortly thereafter with the American publication (as Noah Stewart points out, it makes you wonder where it went on library shelves prior to that, doesn’t it? ), but for a little while it was doubtless quite an intriguing notion – the crime novel as we know it was still in its very nascent stages, don’t forget, and while the content may not have quite matched the cover in that regard…well, more on that later. Berkeley would go on to excel not just at the puzzle plots under his (partial) own name, but also the inverted mysteries published as Franics Iles, with Malice Aforethought (1931) probably the pinnacle of a subgenre that was once again a rather callow baby when Berkeley took it on – if you can’t envisage how the normal tension and surprise of a crime novel can be maintained when the culprit is known up front, you seriously need to read that book. Additionally, like fellow classic crime alumni Edmund Crispin and Anthony Boucher, Berkeley – as Iles – would go on to become a celebrated crime reviewer and a regular feature-writer in newspapers once his career as a novelist had been discontinued. I have no idea why he stopped writing fiction, but in 14 short years he produced a range of novels and had an effect on the crime genre that would be inestimable in a career four times as long and is staggering when its brevity is taken into consideration. I have tried to make the gentleman who eventually solves the mystery as nearly as possible as he might be expected to do (sic?) in real life. That is to say, he is very far removed from a sphinx and he does make a mistake or two occasionally. I have never believed very much in those hawk-eyed, tight-lipped gentry who pursue their silent and inexorable way straight to the heart of things without ever once over-balancing or turning aside after false goals. Berkeley built on this intention throughout his books, in no way inventing the false solution but utilising it in a raft of ways that expanded what was possible within the crime novel: in one book Sheringham outlines the guilty party and everyone agrees they must be shielded from the repercussions of the crime, only for the epilogue to then reveal someone else to actually be guilty. Trial and Error (1937) reverses this setup, with a murderer being unable to convince the authorities of their guilt when an entirely innocent person falls under suspicion (shades there of Israel Zangwill’s The Big Bow Mystery (1891), of course). The Poisoned Chocolates Case (1929) precedes Queen’s The Greek Coffin Mystery (1932) in establishing the trick of multiple wrong solutions on the way to the correct conclusion…while his methods weren’t always the purest (there are two chapters in The Layton Court Mystery that should be wiped from the annals of crime fiction), the new shapes he found for the genre undoubtedly expanded its scope and possibilities in rich and intriguing ways. Additionally, Berkeley was responsible for establishing The Detection Club, wherein the great and the good of crime writing – and Gladys Mitchell – have mixed for years. Not only did this play beautifully into the spirit of the emerging puzzle plot by encouraging some extremely playful and entertaining collaborations, it also established – less sternly than van Dine, and with less scope for misinterpretation than Knox – the form and expectation of the crime novels that era produced, and ensured an environment for these unclubbale men and women that would nurture and encourage the continuation of the spirit of their undertakings for years to come. There is, in short, an argument that Anthony Berkeley is responsible for the shape of the genre as it developed through the Golden Age. Sure, authors would most likely have written those books anyway, but in giving it a name and a structure he helped focus the production of plots that we’re still reading, loving and craving some 90 years later. Durability: Being far less hidebound than many of his contemporaries, Berkeley veered more erratically around the roads and alleyways of classically-defined crime fiction, and it has to be acknowledged that a fair amount of his writing doesn’t quite hold up these days. This is in part because he was establishing the rules when the very notion of having rules seemed a little outré, but also because so many authors then followed suit and refined his ideas to the rapier that most of the classics remain. He has…very often been wrong. But that never deters him from trying again. [H]e has unbounded confidence in himself and is never afraid of taking grave decisions, and often quite illegal ones, when he thinks that pure justice can be served better in this way than by twelve possibly stupid jury men. Many people like him enormously, and many people are irritated by him beyond endurance; he is quite indifferent to both. Possibly he is a good deal too pleased with himself, but he does not mind that either. Now, find me a detective in contemporary fiction to whom that description cannot be applied in all good faith. It’s John Rebus, it’s Harry Hole, it’s Jack Reacher, it’s John Luther…it is, in fact, the template of pretty much every detective going. It would be hideously discourteous to claim that all fictional detectives are simply the bastardised reimagining of Roger Sheringham – not least because literary influences are a Gordian knot of unfathomable proportions – and fallacious to say that Berkeley did this first or trailblazed Sheringham in that way (it equally applies to Holmes, of course), but he captured the essence of not just the gentleman detective or the amateur genius detective but of all detectives, and provided a basis and a reasoning for persevering in this spirit. More than this, though, is the fact of a) Berkeley speaking out on Sheringham’s behalf – recognising, perhaps, that he was something of an arse to begin with – and b) the careful and gradual changes even in his few books that Sheringham went through come the end of his time. There was an admission there of the role played by the detective as a proxy for the reader, and the idea that the reader will be more inclined to side with a character if they are, if not likeable, then at least aware of their flaws. There’s a nugget of something there, seen for possibly the first time, that has endured throughout all narrative fiction, and will remain true long after Berkeley and his peers have unjustly faded from memory. Honestly, Berkeley is the one King of Crime I can’t see a legitimate objection to (even Carr could be criticised on a couple of points if people wished to try, though they’d be wrong). You might feel I’m overstating his importance, but that’s one of those matters of opinion that make this kind of thing so much fun. Or you may disagree that he deserves a place ahead of Ellery Queen – citing their broader range of platforms that encompassed TV, radio, and their own short story magazine – but I think the work Berkeley did and the short time in which most of it was achieved steered the ship in a much more appreciable (though less visible) way. 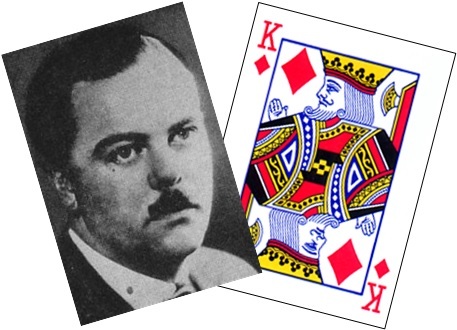 The King of Diamonds because…: In cartomancy, the King of Diamonds is a powerful, shrewd man who wields tremendous influence, and I think the ‘influence’ part of that is key for me. Given his establishment of the rules, form and function of Golden Age detective fiction at its beginnings, and his efforts in establishing the Detection Club to serve the purposes of writers and readers alike, Berkeley is for me the prism through which the Golden Age must be viewed: he separated out the essential elements of these books and provided guidance on how and why to write them; without him, the Golden Age would look very different indeed. Excellent post – I do need to read much more of Berkeley Cox, so can’t really comment on his work but out of curiosity – how much Mitchell have you read? Because if anyone stands out for me as being in the wrong club, it’s Marsh, not her. Off the top of my head I’ve read Speedy Death, Mystery of a Butcher’s Shop, The Saltmarsh Murders, Tom Brown’s Body, Watson’s Choice, The Twenty-Third Man…and possibly one more. I’ve probably read about the same amount of Marsh, and while I’m not a fan I can see her being included for the sake of sheer classical formula…too much of Mitchell is spuriously motivated and reasoned for my liking! Ironically, I don’t think that you’ve read any of the Mitchell’s that I’ve seen recommended. (Well, maybe Saltmarsh, but that person admits that they haven’t read much Mitchell) 😛 Merlin’s Furlough, Death at the Opera, As I Lay Dying…bad choice, perhaps? I admit, I haven’t read Mitchell, but I’m far more tempted to try her than Marsh(read two short stories, bleh). I’d rather read a bad book that tries something different/has something different about it than a bad book which also happens to be boring, you know? I have to read more Berkeley, not to mention Iles. Shamefully I have only got The Poisoned Chocolates Case (which I prefer in its short story form – I could see the cleverness of the long version, but it began to drag… but then again I was going out of my mind on a seemingly-interminable rail-replacement bus journey). Surely King of Shovels would be a more appropriate title for mystery fiction? I know what you mean about TPCC (and rail-replacement buses!). There’s always something about novels based on short stories that feels very airy, like there’s suddenly all this extra space that the 15 page idea is struggling to fill now it has 200 pages to itself. The only example of doing this well that springs to mind is Christie’s Dead Man’s Folly, but then that was already quite a long short story to begin with. And, yeah, King of Shovels does seem a lot more fitting, doesn’ it? Shall keep that in mind! I have read only one book of the author The Poisoned Chocolates Case and I found it dull. I’ll now try The Layton Court Mystery. I’ve read Berkeley’s The Layton Court Mystery, The Silk Stocking Murders, Death in the House, The Poisoned Chocolates Case and Trial and Error. The latter is my favourite and is much closer to his work as Frances Iles (Before the Fact and Malice Aforethought are absolute classics of the genre and in my opinion make him a King of Crime, just for those two). When he is writing as or like Iles, I think Berkeley’s depiction of psychology and creation of sneaky, clever and entirely plausible twists is much higher. Wouldn’t say Sheringham is a favourite fictional detective of mine and I probably prefer Berkeley’s non-serial novels. I suppose another point in Berkeley’s favour for being a King of Crime is the films his books also inspired, as Hitchcock did adapt Before the Fact. Very glad you chose Berkeley over Queen, as I much prefer the former to the latter. I certainly agree that MALICE AFORETHOUGHT is a classic. I wasn’t quite so impressed by BEFORE THE FACT – possibly because Hitchcock’s film version seemed a lot tighter and eliminated a long sub-plot. Have you read C. S. Forrester’s PAYMENT DEFERRED? It was published in 1926 and anticipated many of the features of the Iles books. Ooo, no, I hadn’t heard of Payment Deferred. In my mind Forrester wrote books about naval battles and…sea things and the like, so this is indeed exciting news. Much appreciated, shall get researching. Your argument for Berkeley is sound, JJ, and, after reading Martin Edwards’ account of The Detection Club, I agree that ABC belongs here. I seem to have enjoyed TPCC more than the rest of you, but I also agree that his strongest literary contribution lies in the inverted mystery. I will say that, after reading your arguments here, I will feel a little more contentious if your fourth King is NOT a certain someone because the argument of influence applied to non-writing matters can oh so easily apply to that author as well. Finally, a question: to what story are you referring when you mention Dead Man’s Folly? I’m not aware of any shorter tale being expanded to provide this novel! Oh, and you have to tell me who it’ll be contentious to miss out; it’ll make no difference at this stage, I just want to know how much grief I’ll end up copping…! First of all: Oh My Freaking Goodness! I think I read about the novella somewhere and forgot, but I had no idea it had been made available. DMF has always been one of my least favorite Poirots because it felt both dragged out AND insubstantial! The question is: do I plop down forty five dollars for the Adams illustrations, or do I simply read this on Kindle for $2.99? As for my candidate, well, I still don’t think I should tell you because then you might dig your heels in even further. Clearly, his extensive canon of books provokes a more mixed reaction than I might have believed, based on comments I’ve read here and elsewhere. (Although you yourself have admitted he’s more clever than ABC!) In addition to his writing, however, there’s his vast influence on publishing, which continues decades after his death(s) and makes him more than deserving of further consideration as your king of spades before you toss him aside! Have I made myself clear?!?!? As a novella it’s interesting, but not $45 of interesting. But the illustrations are nice…maybe shop around a bit before rushing into anything, eh? And, don’t fret, it was your candidate (as a male Queen of Crime) who started this all off, if you remember. I’m not so obstinate as to dig my heels in just because someone disagrees with me, and I’m happy in my own mind as to who the King of Shovels will be…it’ll be interesting to see what people make of the final line-up. But, don’t fret, I already have a related follow-up in mind (in a couple of months, though, not right away). Yes, there is no such magazine as Anthony Berkeley’s Mystery Magazine ! I like Anthony Berkeley, and I would rate ‘The Poisoned Chocolates Case’ as one of my top reads for 2015. The mystery, while not especially intricate, was definitely clever in a self-conscious fashion – but above all Berkeley’s sense of humour struck me to be somewhat Dickensian, and was therefore right up my alley. I proceeded to read ‘The Piccadilly Murder’ and ‘Murder in the Basement’, and while I found them enjoyable, I also wished that the humour would be complemented by stronger puzzles. Are there any other novels published under the name of Berkeley – as opposed to Iles – that you would recommend, apart from ‘The Poisoned Chocolates Case’, ‘Trial and Error’ and ‘Jumping Jenny’? Having a soft spot for Berkeley means that I’m not overly outraged that he has taken Queen’s place as the King of Diamonds. I would concede that the Queen novels I have read boast of (much?) better mysteries, though none of them would come close to ‘The Poisoned Chocolates Case’, or even ‘Murder in the Basement’, in terms of entertainment value! To be honest, I think you’ve seen the best of him. TC has recommended Panic Party, and that’s the only one I don’t know, but I’ll get round to correcting that at some point in 2016. I agree Berkeley is among the exceptional few against who there’s barely any legitimate objection to be crowned a King of Crime: a genuine original writer and innovator who contributed several ideas that spawned as many imitators and innovations as Chesterton’s “The Invisible Man” and Doyle’s The Valley of Fear (“The Birlstone Gambit”). The most notable one, and perhaps the most overlooked, is Panic Party, which is a direct, literary ancestor of Christie’s And Then There Were None and Golding’s Lord of the Flies. However, the best and most defining example of Berkeley’s considerable talent as a mystery novelist can be found in the first round-robin novel by the Detection Club, The Floating Admiral. It was a surprisingly successful experiment, but only because Berkeley skillfully tied everything together in the final chapter and retrospectively created a coherent narrative. Berkeley made it seems as if the whole thing was planned like that from the beginning. So, yes, while my loyalty lies with the King of Hearts, I can live with Berkeley as the King of Diamonds. Oh, I couldn’t agree more about The Floating Admiral – that final chapter (called, if I remember correctly, Clearing up the Mess) was my first experience of Berkeley, and it’s a truly fabulous piece of writing, particularly given the way people had trampled over each others’ clues, timelines and events throughout. That was what got me started and, interestingly, it’s only Panic Party that I haven’t been able to track down…but anything that can be mentioned favourably in the same breath as AttWN immediately achieves extra importance in my eyes, so I shall hop to it! That’s EXACTLY who I was referring o, JJ! A-si-mov! A-si-mov! A-si-mov!! But if I say that name, and am right, it gives it away. 😦 Ah well. Chesterton. That’s my guess. Well, there’s nothing to worry about, then, as I ruled Chesterton out at the start on account of him being predominantly a short story writer. Kings have to have the guts to take on longer plots! Just come across this post and found it enjoyable and well argued. Berkeley was a fascinating writer. Later this year, you may just be in for a pleasant surprise. Can’t say more at present, but there will be some interesting news for Berkeley fans by the middle of the year. Would I put him above Queen? Probably not, but then I’m a big EQ fan, and I understand why you did put him above EQ. Anyway, the point of my comment: in Doug Greene’s Carr biography, I believe there’s a reference to JDC’s saying that Berkeley and Queen were his favorite contemporary detective story-writers and that Berkeley would have been his #1 favorite if “Tony had not stopped writing so early,” or something like that. Or is that quotation in “The Grandest Game in the World”? Either way, a pretty powerful recommendation that supports your case! I think that what holds Berkeley back from true “legend of the genre” status is that so few of his books are clever in the Christie mould: a lot of what Berkeley did was extremely clever in how he played with conventions, but the books are sometimes weak as a result — The Second Shot, for one, and the diabolically awful Not to Be Taken for another.